War Games: What will warships look like in thirty years? The British Ministry of Defence and Royal Navy challenged young scientists and engineers to design a future warship and the results may surprise you. 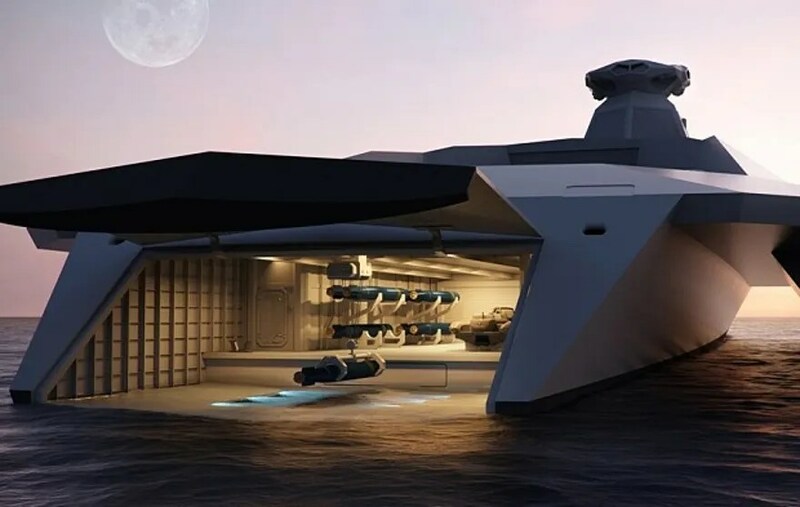 Defense procurement specialist Startpoint has released stunning images of what the futuristic ship could look like. This cutting-edge ship concept has been dubbed Dreadnought 2050 in honor of the 1906 HMS Dreadnought, a Royal Naval battleship that eclipsed all other warships at the time. Dreadnought 2050, made of futuristic material, features state of the art weapons, command center and more. The ship’s structure is made of ultra-strong acrylic composites that can be turned translucent so that crew can see through it. This means that from the Ops Room, commanders could see through the hull and watch close-in battles play out. The new Dreadnought would be equipped with a range of state-of-the art weapons like high-velocity torpedoes, speed-of-light weapons and drones constructed on the ship using 3D printers. The graphene coated acrylic hull would be super strong. At the bow, Dreadnought 2050 has an electromagnetic railgun that can fire projectiles as far as long-range cruise missiles can go today. Along the sides of the ship there are missile tubes. These tubes can launch missiles faster than Mach 5 – a hypersonic speed. The futuristic vessel is also equipped with directed energy weapons to thwart incoming threats. In the outrigger hulls, there are torpedo tubes that fire supercavitating torpedoes that travel at more than 300 knots. Supercavitating torpedoes can travel at such whopping speeds because they move through water in a sort of air bubble that reduces drag and friction. Instead of a standard mast, Dreadnought 2050 has a tethered quadcopter that flies above the ship. The quadcopter is equipped with multi-spectral sensors that provide critical data. But it is also armed with a laser to take out threats like enemy aircraft, missiles and more. To provide the significant power these capabilities require, the quadcopter’s tether is made of carbon nanotubes that are cryogenically cooled. A floodable dock, or “moon pool,” is incorporated into the design so that amphibious teams like SEALs or Royal Marines can rapidly deploy. The moon pool could also be used to deploy unmanned underwater vehicles on missions such as searching for explosive devices. Above the dock there is an extendable flight deck and hangar that can be used for a fleet of weaponized drones. A similarly-sized warship operating today would require about 200 crew, but the innovative warship would require less than half as many personnel. A current Ops Room, for example, could require 25 sailors to run it. Dreadnought 2050’s Ops Room could be run by as few as five Sailors. 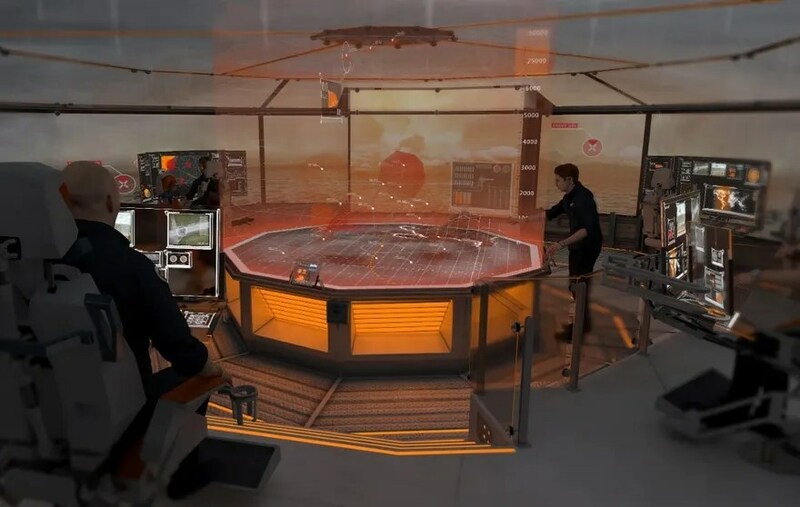 Dreadnought 2050 features an Ops Room with a 3-D holographic command table. The holographic image can be rotated and commanders can zoom in on specific parts of the battlefield. From the Ops Room, five or six people can control all operations from the deepest parts of the ocean through to outer space. From underwater and sea surface through to land and air, all areas of operation can be displayed and reviewed. Crew can use smaller holographic pods to manage specific areas of operation. Real time data can be transmitted including secure voice, video or data to wherever it is needed. The Dreadnought 2050 warship is powered by a fusion reactor or highly efficient turbines. The turbines drive silent electric motors to water jets. The graphene coating on the hull helps reduce drag and enhance speed. And the Dreadnought will have a low profile to ensure it is stealthy and hard to detect.